In a medium-sized bowl, combine half of the yogurt with the sour cream, lemon juice, cumin, salt and pepper. Set aside. Mix the other half of the yogurt with the grated cucumber, cilantro and green onion. Keep in a tightly closed container and store in the fridge. Season the chicken breasts as desired with salt and pepper on both sides. Cook the chicken over your grill or BBQ for around 12-15 minutes on each side or until well cooked. Before flipping over, dress the top with a bit of the first yogurt-cumin sauce prepared in this recipe. Repeat on the other side. Discard any remaining sauce. When ready, serve with cold cucumber-yogurt sauce and a portion of potato puré or slice your chicken for a fresh pita sandwich. You can use freshly chopped mint instead of cilantro. On occasions where we don’t know what to cook for our familias, it's good to remember that there are plenty of easy recipes you can prepare with budget-friendly ingredients. Usually we can already find most of these ingredients in our own freezer or pantry. 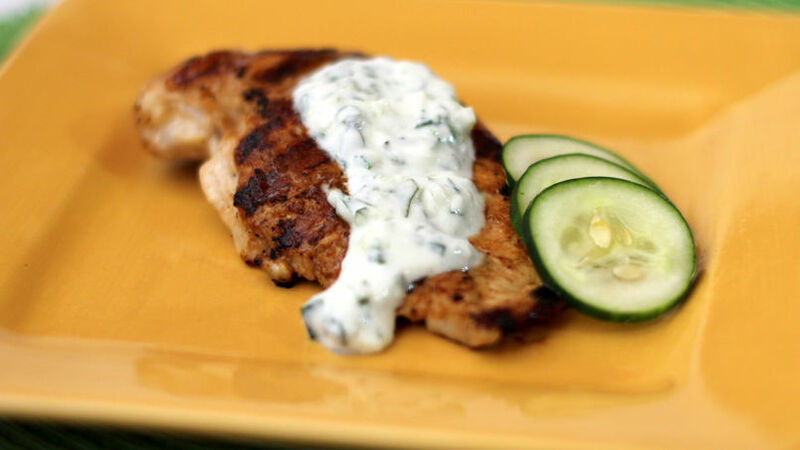 Here this is just the case- these grilled chicken breasts paired with a cucumber and yogurt sauce create a new and refrescante combination with great flavor.